Geelong West is a residential suburb immediately adjoining Geelong on Corio Bay, which is on the western side of Port Phillip Bay. Between 29 May 1875 and 18 May 1993, Geelong West was also a municipality, which included Herne Hill and Manifold Heights. In 1839 blocks of land of about 10 ha were sold by the Government in Geelong West between Pakington Street and Shannon Avenue, northwards from the Barwon River to Church Street. Smaller blocks of about 0.6 ha were sold two years later. Within a year a contemporary almanac referred to the Ashby Village. The reason for releasing the land was probably the high speculative prices being paid for land in Geelong central. Between 1843 and 1846 the empty land between Geelong and Geelong West, that is, between Pakington Street and Latrobe Terrace (later the municipal boundary), was sold as suburban allotments. An area south of Ashby became known as Little Scotland, although in the 1857 census it did not have a particularly high population of residents with a Scotch or Presbyterian religious affiliation. There was also a Kildare Village east of Shannon Avenue and north of Ashby, and census data does not reveal a particularly large Irish population despite the village’s Irish name. The churches opened several schools: Anglican at Kildare (1851); Presbyterian at Ashby (1852); Catholic at Ashby (1853) and Kildare (1855); and Methodist at Ashby (1855). None lasted much beyond 1874 when the Ashby Public School – later Geelong West primary – was opened. During the mid-1850s there was local agitation for municipal separation from the Geelong town council. Twenty years of effort were rewarded on 29 May 1875, when the Geelong West borough was proclaimed. Its western and eastern boundaries were McCurdy Road and Latrobe Terrace respectively, and the northern and southern boundaries more or less Church Street and Aberdeen Street. In 1926 an area between Church Street and Bell Parade was taken from Corio shire and added to the borough. It included the bayside suburb of Drumcondra. Its area was 5.26 sq km. 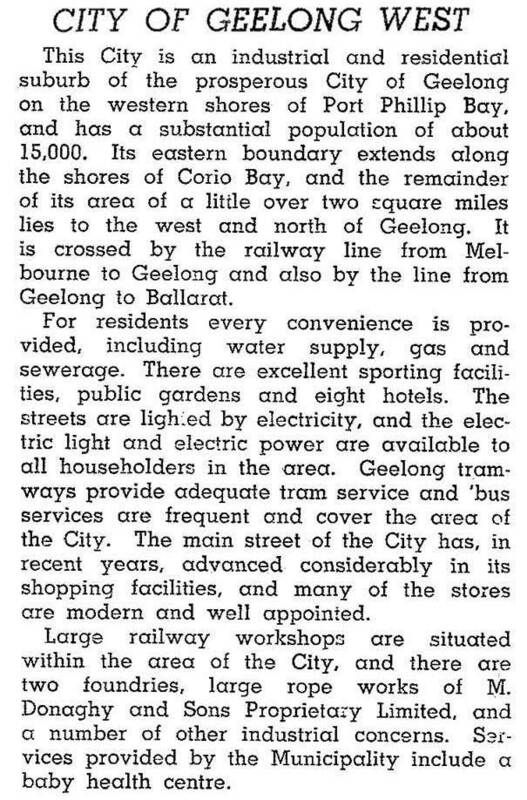 Geelong West became a town on 22 March 1922 and a city on 17 April 1929. Several industries were established in Geelong West, the largest being Donaghy’s Rope Works (1873) in Pakington Street. The Newberry foundry (1886) in Lupton Street was a source of both local employment and cast-iron building materials used for the many timber houses to be found in Geelong West. Shopping in Geelong West had begun in Pakington Street in the 1850s, and it became the main shopping strip in Geelong West. It was served by a tram line (1912). Other tram lines ran along Church Street and Latrobe Terrace, confined to the eastern side of the municipality. This left nearly two-thirds of the municipality to be served by buses which came in 1926 with Benders Busways. Manifold Heights in the middle of the municipality came under residential development in the 1920s, and Herne Hill to its west is mainly a postwar suburb. Commercial and industrial buildings in Geelong West are sometimes two-storeyed and made of brick, but the vast majority of houses are single-storey timber structures, varying from cottages, double-fronted Edwardian or Federation style and through to Californian bungalow. Pakington Street remains the civic and commercial centre with Baptist, Uniting and Presbyterian churches, the former Geelong West town hall (rebuilt 1923), library, nearby Ashby and St Patricks Catholic primary schools and a long shopping strip with off-street parking. One of Victoria’s oldest buildings, the former Harp Inn, is at 22 Pakington Street. Shannon Avenue has a smaller shopping area, but with a large supermarket. Geelong West has four reserves (three with ovals), and there are more reserves in the former municipality’s suburbs of Herne Hill and Manifold Heights. West of the Pakington Street shops there is Sparrow Park (c1935) formerly Sparrow’s paddock. The technical school (1954), later Western Heights secondary college, was in Herne Hill. On 18 May 1992, Geelong West city became part of Greater Geelong city.